Description: Calathea warscewiczii is a tropical and tender evergreen perennial herbaceous plant native to Costa Rica and Nicaragua and produces lanceoate leaves that have a dark green background and an attractive fishtail pattern on the upperside of the leaves. The wonderful coloured leaves of Calathea warscewiczii are completed by a velvet-fuzzy texture, an attribute of this particular species. Calathea warscewiczii can grow up to 0.5 to 1 metres (20-40 inch) high, 0.5 to 1 metres (20-40 inch) wide. The leaves have a contrasting maroon-purple coloured on the reverse of each leaf . Besides its attractive leaves, Calathea warscewiczii also produces showy cone-like inflorescences. The bracts that cover the cone are creamy white in colour when they first emerge and they gradually turn to yellow and take on a pinkish hue with time. They are spirally arranged around the cone and the rims of these bracts fold over the edge, which make the entire cone looks somewhat like a rose flower when viewed from the top! Care: Calathea warscewiczii needs to be grown in an area with bright, filtered sunshine. Like most other sensitive calatheas, direct sunlight can burn the leaves of this plant. This plant likes to be grown in an area with high humidity and protected from winds. Light: Place the Calathea warscewiczii plants in an area of the home or garden that remains bright during the day, but receives very little direct sunlight. Direct sunlight can bleach the color out of the leaves, and can even curl or burn the leaves. Calathea warscewiczii should be kept in partial shade especially during the hotter months of the year. During the cooler winter months, the Calathea warscewiczii should be moved to a brighter area to provides a fair amount of sunlight, but still should not be exposed in direct sunlight. Direct sunlight will not only dull the vibrant colors of the plant, it can scorch the leaves and ultimately kill the plant. Temperature: The Calathea warscewiczii prefers average to warm air temperatures: 18-27°C (65-80°F) year-round. During the cold months, the Calathea warscewiczii should be kept at temperatures of 16°C (60°F) and above. Sudden drops in the air temperature can damage the foliage. Water: Water Calathea warscewiczii depending on the season. During the growing season and during warm or hot temperatures, keep the soil moist but not soaking. In the winter and during cold temperatures, allow the soil to become slightly dry before watering again. Place Calathea warscewiczii’s pot in a pebble tray filled with water. This will help keep the humidity high near the plant. Keep well watered in summer; Calathea warscewiczii love high humidity mist. The soil should be kept moist at all times but should not be water-logged. Water Calathea warscewiczii with distilled or bottled water. Hard water and contaminants sometimes found in tap water can damage the plant’s roots. Soft, tepid water is best for watering the Calathea warscewiczii. Leaves that become curled, spotted, or appear to have yellowed are signs that the Calathea warscewiczii is not receiving enough water. Humidity: The Calathea warscewiczii is a humid-loving plant and should be misted regularly. The soil can be surrounded with damp peat to help provide and retain humidity levels. For rooms that have low levels of humidity, a humidifier can help maintain humidity levels that this plant needs. The ideal temperature for a Calathea warscewiczii is between 18-27°C (65-80°F) with a humidity level above 70 percent. Try to maintain at least 50% relative humidity year-round. Browning of the foliage tips or loss of leaves can be a sign that the plant is not getting the humidity that it requires. Wintering: Keep warm minimum of 16°C (60°F). During the winter months (non-growing season), reduce the amount of water provided as too much water in the cooler weather may lead to rotting stems. Display Calathea warscewiczii in light shade during summer. Brighter in winter but keep out of direct sun, this will dull the colour of the leaves, and could be fatal! Soil: Peat-rich potting mix. Loam with high organic matter. 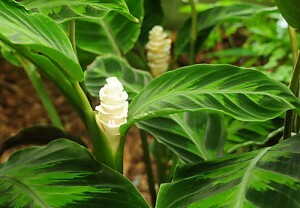 It is best to grow Calathea warscewiczii in well-drained mix that is rich in organic matter. The fibrous roots need to be in contact with moist soil at all times and it should not be allowed to dry out completely. Mulch generously to help keep the roots moist and cool. Waterlogged conditions should also be avoided as roots can rot away. When the plant is grown in an area that is too hot, dry or windy, its leaves will curl up into a roll and leaf edges will likely to turn brown as well. Unhappy plants tend to exhibit stunted growth. It is a challenging plant to grow in highrise apartments due to the dry and often windy conditions. Fertilizer: Feed Calathea warscewiczii with a liquid fertilizer diluted by half every 2 weeks spring through fall or feed with a very weak solution when watering the plant. Use only water-soluble fertilizers and follow product instructions regarding the amount of fertilizer to use, as this will vary depending on the size of the plant. Do not use fertilizer at full strength or fertilize the plant too often. Overfertilizing can cause leaf spots. Pruning tip: Calathea warscewiczii will benefit from occasional pruning, which helps to give it a nice shape and promote new growth. Fall is the best time to cut it back. Use sharp pruners to cut away some of the older leaves. Re-potting: The Calathea warscewiczii should be re-potted every two years, preferably in the spring. A peat-based potting mix will help the plant retain moisture and humidity. Propagation can be done when the plant is being repotted. Propagation: By dividing rhizomes, tubers, corms or bulbs (including offsets). In spring, take 10 cm (4-inch) stem cuttings with 3-4 leaves attached. Root them in moist potting mix. When the plant gets too big, it can easily divide it in half by pulling apart its shallow roots. Propagated plants should be kept warm until they have been established. Uses: Common as houseplants the Calathea warscewiczii are a stunning plants. With bold leaf markings as well as the bonus of the purple underside they are a great choice for a shady room. In warm climate condition Calathea warscewiczii is a beautiful plant for shady areas in a tropical themed garden. Problems: Watch for spider mites. Dry indoor air in the winter months encourages these pests to invade house plants, another reason to keep the humidity up. A webbing will be noticed between stems and on the undersides of leaves.